Our well qualified team of professionals conducts various business operations with full commitment and dedication. We are engaged with flawless production facilities for footwear production for our customers as per their specifications. We have divided this unit into various departments in order to carry out the entire business operations in a hassle-free manner.We have divided this unit into various departments in order to carry out the entire business operations in a hassle-free manner. We provide a congenial working environment for our personnel that helps them come out with some distinct designs and hence increasing the productivity of the company. For the safe and bulk storage of the offered products, we have developed a capacious warehousing unit at our base. We also adopt several techniques for maintaining the optimum temperature in order to prevent spoilage of our products. Moreover, a team of warehousing personnel is recruited by us for the proper maintenance of our warehouse. All our finished products are firmly packed by a pool of packaging logistics. 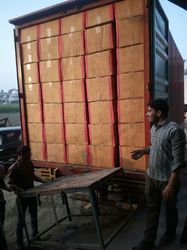 These professionals make use of tamper-proof material to pack these consignments thus, ensuring safe transit. We are engaged with flawless production facilities for footwear production for our customers as per their specifications. For the safe and bulk storage of the offered products, We have developed a capacious warehousing unit at our base.